Steve, Cathy, and Nicholas -- Nicholas loses his first baby tooth (created 2008-09-18). For a couple of weeks, Nicholas has had a loose tooth. He would show everyone how he could push it forward until it was almost horizontal. On Sunday, on the way into church Nicholas shouted out "The wind blew away my tooth." He opened his mouth and there was a big gap where his loose tooth was. I didn't think the wind could have blown the tooth out, but we looked around for a while with no luck. I think that he swallowed the tooth in the car while eating trail mix. Before and after church, he had to tell everyone what happened. Like a great showman, he revealed the story in pieces. First he told them that he had just lost his tooth. Then after all the oohing and ahhing stopped, he would show them the gap in his mouth. Pause for some more oohing and ahhing. Then he would tell them that he swallowed the tooth. After the laughter subsided, he would reassure them because a friend of his swallowed their tooth and still got money from the tooth fairy. 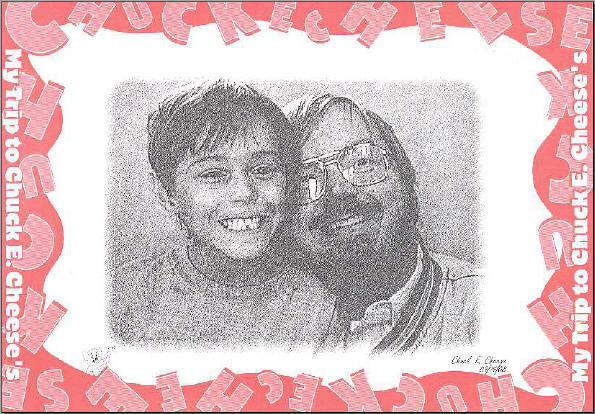 Nicholas talked me into a trip to Chuck E. Cheeses after church (Mom was working, so we had a whole afternoon by ourselves). Here's the picture we took while we were there. We had to write a note to the tooth fairy explaining what happened. This was an opportunity for Nicholas to practice writing. He included this picture as proof under the pillow along with the note. And just like his friend, he got a dollar from the tooth fairy. By the way, Cathy informs me that the tooth fairy is a "she" and not a "he." I never suspected. Nicholas says now that he was awake when the tooth fairy visited. We have proof otherwise, but we won't tell.